Can you identify the players in this 1939 Charles Peterson photograph? Readers will recognize (from left) Eddie Condon, exhorting; Bobby Hackett and Jimmy Dorsey, keeping an eye on their leader, Zutty Singleton, peering around the corner; Pee Wee Russell, aiming for the clouds. But the left-handed and bespectacled string bassist in the rear of the ensemble is less familiar. His name? Mort or Morty Stulmaker. Although his jazz career was brief, he played and recorded with the best musicians and vocalists of the time: Bunny Berigan, Red McKenzie, Condon, Joe Marsala, Stan King, Jack Teagarden, Dave Tough, Max Kaminsky, Bud Freeman, Brad Gowans, Billy Butterfield, Lee Wiley, Red Nichols . . . I thought he would be one of the mysterious, shadowy figures of jazz, not only because he was a bassist, but because apparently no dramatic story attached to his life. 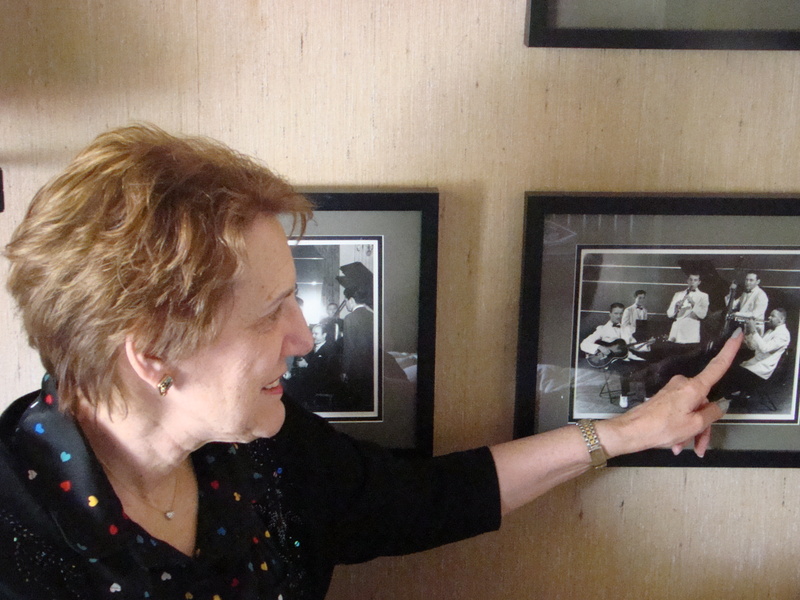 I was delighted to meet Phyllis Ger, a jewelry designer who also volunteers at the Louis Armstrong House Museum — and to find out that she was Mort’s only child. Here is what Phyllis told me on a pleasant afternoon recently. My father liked to be called Mort or Morty. His first name was Morton, but the only person he allowed to call him that was his sister. The family name is German, practically always misspelled with an “H” (Stuhlmaker) which would always aggravate my mother but never seemed to bother Dad. He was born in Albany, New York, in 1906 and had two brothers and one sister. Dad came from a musical family. His mother played piano, his father and two brothers played the violin. There must have been piano lessons because Dad was a trained musician. He started his career playing piano accompanying silent movies when he was in his teens. I don’t know how he made the transition to bass from piano. He was a left-handed bassist which was not that common. Both sides of my family were from the Albany-Troy, New York area. But, of course, Dad could not make a living as a musician up there, so he moved to New York City. Although I was born in Manhattan, I was two years old when we moved to Albany. Dad would spend weekends at home and travel back to the city during the week to pick up some gigs. After six years of a fabulous time growing up in Albany surrounded by all my cousins, aunts, and uncles, my parents made the decision to move back to NY where we could all be together permanently. Dad was very unpretentious. He didn’t speak about his life as a musician to me very often. He said it wasn’t a profession that he was that proud of even though he played with some of the greats. He felt that musicians were never given the credit they deserved. But, he never said that there was anything else he had wanted to do; you make a living at something and you stay with it. So, when he married at age 39, he left the life of a traveling musician and became an organ teacher and salesman at Macy’s 34th Street in New York City. Dad also taught at Aeolian on 57th St. for several years. In addition, he had many private students. My Dad was a very sensitive and compassionate person. He was not good with handling financial matters and left that to my mother. I could never see him actively promoting himself. That was just not his personality. He was devoted to Mom and me. I am an only child (and not spoiled). They were determined not to spoil me. When I asked Mom why she waited until she was 39 to marry, her response was: “I was waiting to meet your father.” And, so, a marriage of 44 years resulted. 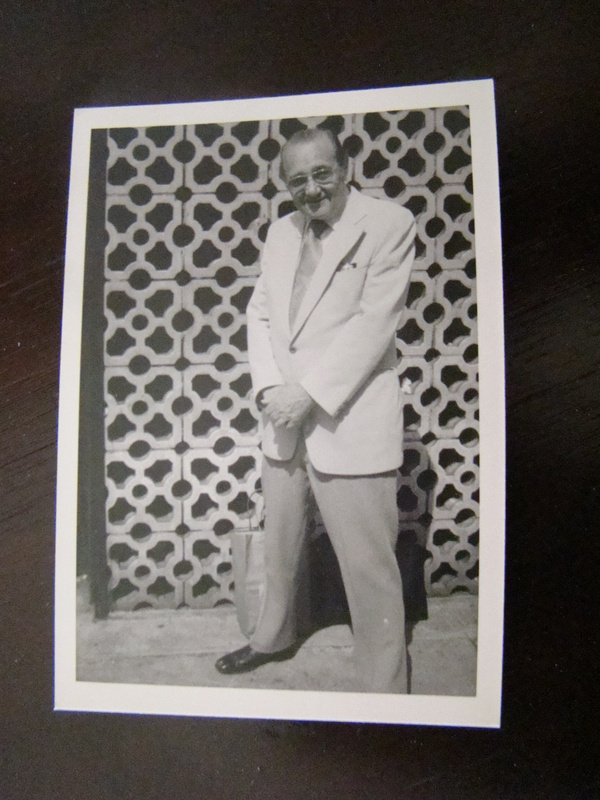 I started to do research about my Dad about five years after his death in 1988 at the age of 82. Since I knew so little about his background, I was amazed at the amount of material I discovered. I didn’t know he played bass with Benny Goodman, Eddie Condon, Red McKenzie, Bunny Berigan, and many others. When Did did speak sparingly about his background, Bunny’s name came up quite frequently. 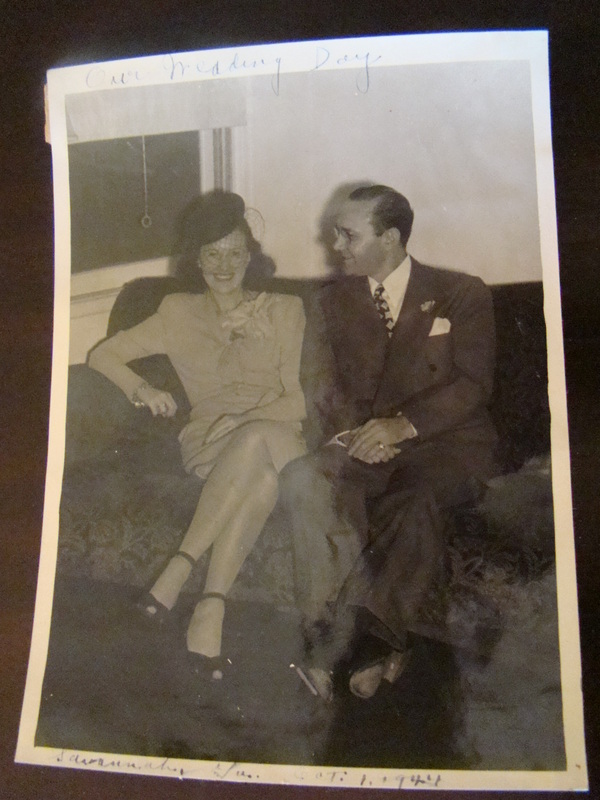 As part of my discoveries, I was fortunate to get to know Bob Dupuis, author of the first biography about Bunny entitled: BUNNY BERIGAN: ELUSIVE LEGEND OF JAZZ,. From 1998-2001 I attended the Bunny Berigan Jazz Jubilee in Fox Lake, Wisconsin (Bunny’s hometown). This tribute weekend was originally organized by Bunny’s daughter, Joyce and her husband, Ken Hansen. What a thrill it was for me to be a part of that weekend! Sadly, both Joyce and Ken have passed. But, the Jubilee is still taking place each year (May 18th-20th, 2012) under the very capable leadership of Julie Flemming. I will be attending this year after an absence of 11 years. Even though I do not play an instrument, I got Dad’s creative genes in another way. I am a jewelry designer and will be displaying my music-themed pieces at the Jubilee. Please come and join us for a wonderful weekend of jazz. I knew Dad played with Artie Shaw. I contacted Mr. Shaw who was in his eighties at the time. An assistant to him answered my letter but unfortunately Mr. Shaw had no recollection of my father. I think I may attribute that to the aging process. I also spoke with Joe Dixon when he was presenting a concert at a library on Long Island. I was able to visit with Buddy Koss and his wife for a lovely visit and that was very nostalgic for me. But, sadly, nobody’s left now. Dad was very much respected by other musicians. He played at Hoagy Carmichael’s wedding, who had handpicked the musicians he wanted. 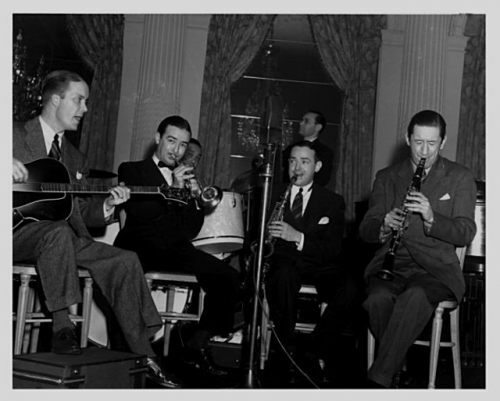 Dad was part of the first mixed band to play on 52nd St. with Joe Bushkin, Eddie Condon, Joe Marsala and Red Allen. Dad was quite friendly with Joe. That’s me proudly pointing to my Dad in the photo. I’m hoping that some JAZZ LIVES readers have other information to add to our knowledge of Mort Stulmaker: send it here as a comment or if you’d like to get in touch with Phyllis, email me at swingyoucats@gmail.com. and I will pass it along to her. This entry was posted in "Thanks A Million", Jazz Titans, Jazz Worth Reading, Pay Attention!, Swing You Cats!, The Heroes Among Us, The Real Thing, The Things We Love and tagged Artie Shaw, Benny Goodman, Billy Butterfield, Bob Dupuis, Bobby Hackett, Brad Gowans, Bud Freeman, Buddy Koss, Bunny Berigan, Charles Peterson, Dave Tough, Eddie Condon, Fats Waller, Hickory House, Hoagy Carmichael, Jack Teagarden, Jazz Lives, Jimmy Dorsey, Joe Bushkin, Joe Dixon, Joe MArsala, Joyce Hansen, Julie Flemming, Ken Hansen, Lee Wiley, Max Kaminsky, Michael Steinman, mixed group, Mort Stullmaker, Pee Wee Russell, Phyllis Ger, Queenie Ada Rubin, Red Allen, Red McKenzie, Red Nichols, Robert Dupuis, Stan King, Tempop King. Bookmark the permalink. Such a beautiful story! More light. Thank you. Wonderful Phyllis! I look forward to learning more about your father when we meet at the Bunny Berigan Jazz Jubilee in a couple of weeks. I will be presenting many recordings on which he appeared with Bunny Berigan. Very interesting Phyllis. I look forward to learning more about your father when we meet at the Bunny Berigan Jazz Jubilee in a couple of weeks. I will be presenting a number of recordings you father made with Bunny Berigan.